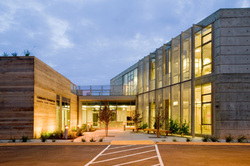 Electrical projects by Triad Electrical, Inc. - Triad Electric Inc.
Community Foundation of Santa Cruz County - LEED gold certified design build office building. Smart digital lighting control, energy-efficient fixtures and supplementary photo-voltaic panels helps to achieve this designation by the US green building council. State-of-the-art touch screen audio video control system coordinates meetings and presentations in six conference rooms and three public displays. From eight separate functions operating simultaneously to keynote speakers view-able from all the rooms at once, this robust control and display system will fulfill their needs well into the future. Santa Cruz Harbor, V Dock replacement of dock facilities lost in the 2011 tsunami, and ongoing maintenance for our local small craft harbor is a great source of pride for our organization. 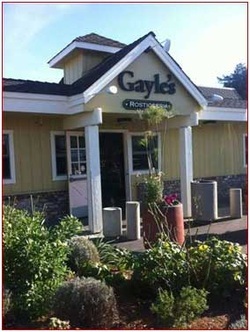 Fast response time and affordable long term contracted rates enable us to provide service to one of our favorite places in Santa Cruz. 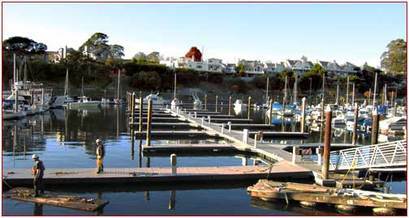 Our marine electrical experience also enabled us to completely rewire the harbor dredge eliminating an outdated existing unsafe electrical system. Santa Cruz Warriors Sports Arena, from high school gyms to this NBA approved basketball arena, Triad has designed and installed lighting and power systems that fill the need. 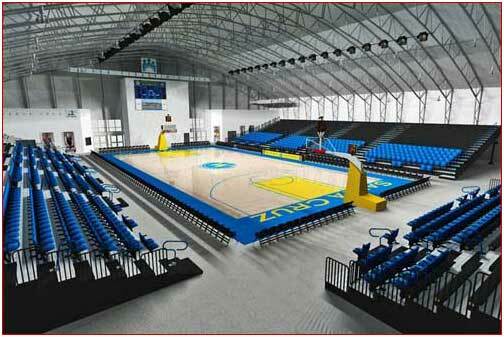 This arena not only serves a professional basketball team but also doubles as a venue for local sporting events. It if fully fitted with all the data, voice, lighting control, network broadcast ready production booth, and concert power and individual ADA headsets. With careful collaboration with the owner, general contractor, and municipal government, this space has filled many needs in the community. This project was fully executed in 12 weeks on an extreme aggressive schedule, and we all met our deadline! 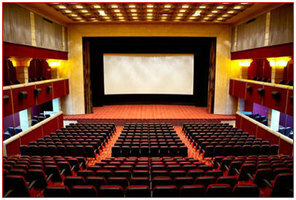 Santa Cruz 9 Plex, in addition to the best in audio video integration for our clients presentation space, Triad has experience in the construction of large scale multiplex cinemas. 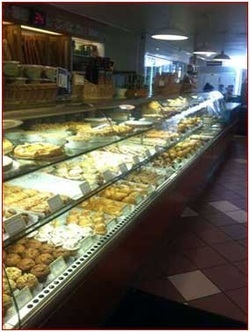 Gayles Bakery & Rotisserie, this high volume retail bakery and restaurant relies on Triad Electric for all their power and lighting needs from distribution to their critical refrigeration equipment to the most flattering lighting for their product. 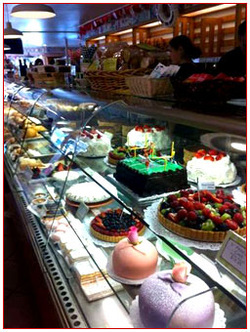 They never have to fear for the warm welcoming atmosphere they create for their customers when Triad is called during open hours. All of our field employees fully appreciate the needs of our clients and more importantly, our client’s customers. ”Wrigley” Building. 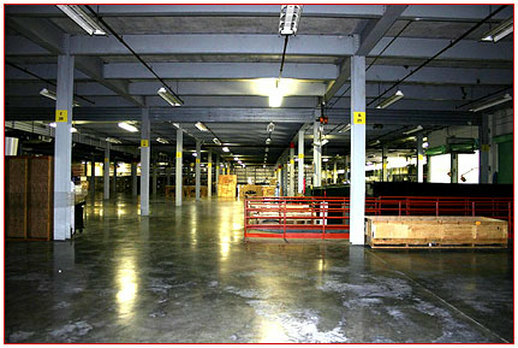 Large industrial manufacturing construction and ongoing maintenance. Triad prides itself on “owning the client” making ourselves an integral part of the organization without being a financial personnel burden to them. After construction we continue to keep the electrical system in the safest, most efficient, and functional condition for years to come by offering complete preventive maintenance programs such as infrared scanning and photography of all switch gear and manufacturing equipment. When you become a client of Triad you get the complete attention and 24 hour service of a full time electrical department without the high cost. You will receive the added value of Triads constant development of improved electrical systems and attention to the latest in energy efficient, innovative products. Commercial office lighting design. We are able to not only help in the selection of light fixtures and control but also model the space in 3-D so you can actually “see” the finished product and the effects of the chosen lighting. Choosing from many worldwide lighting manufacturers we can select the light source most appealing to the end user from fluorescent to LED, incandescent to HID. Pictured is a collaboration area where informal meetings take place. The combination of indirect LED panels up lighting the decorative ceiling treatment and LED strips within modern paper shade systems create soft floating light sources. 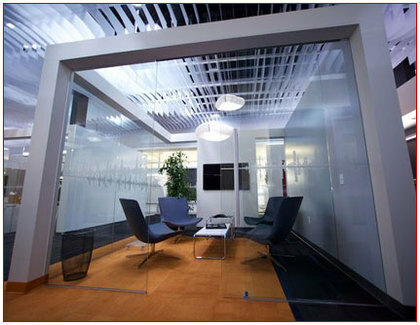 This space incorporates into the surrounding office while still being set apart by creative lighting solutions. 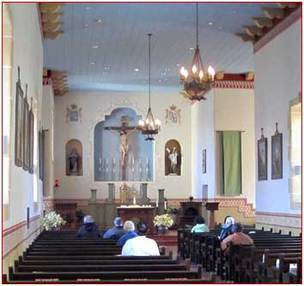 Holy Cross, Santa Cruz; Complete re wiring / theatrical lighting of historic churches. The first, a large historic church post Loma Prieta earthquake required a complete power upgrade; new service, Strand lighting control, massive chandeliers wired and hung exterior lighting. The challenging project required Triad to build catwalks above the frescoed ceiling but below the roof so chandelier wiring and theatrical instruments could be hidden above. The only access being a 100 year old 90 ft. long ladder to the above ceiling space by which all material and personal had to travel. Presidio of Monterey, the second project required the rewiring one of the oldest missions in California. 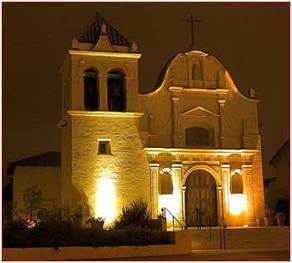 Major structural work and care in preserving all surfaces while providing them state of the art lighting control by electronic touch pads for lighting scenes recessed into adobe walls and flush ground mounted up lights make this historic California mission a showpiece for the city. 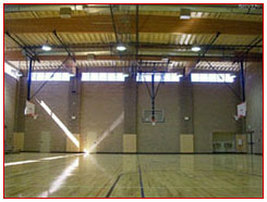 College gymnasium with time of use energy management system along with near professional sports lighting levels for basketball as well as volleyball. Live Oak Business Park, design build of the underground infrastructure for a six building office / industrial park. Site lighting, telephone and cable, power and exterior building lighting. Another completely engineered, turnkey electrical system eliminating change orders due to drawing/ site conditions conflicts. Best Western, Capitola By The Sea, design build of a three story hotel in downtown Capitola. 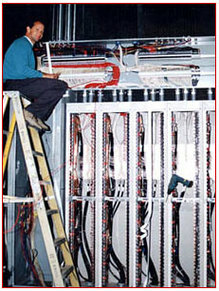 Responsible for all electrical specifications and construction documents including California title 24, load calculations, lighting control and low voltage systems. One of the many, theatrical dimming projects we have completed over the years. 480 channel Century Strand dimming system and complete rework of the light battens made this job fun. Careful attention to numbering and dedicated neutral conductors made it satisfying to have commissioned without a single failure. 900 dimming circuits create any mood for the main theater at University of California Santa Cruz's performing arts center. Triad removed the existing system, re-located the dimmer banks and installed the new ELS scene controller board in one week! This was the result of years of experience interfacing with university officials as well as manufacturer's engineering departments. 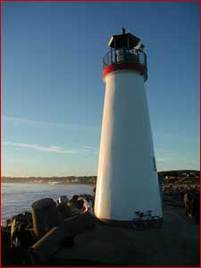 Santa Cruz Harbor Lighthouse. Extreme marine conditions, and a site that can only be described as awkward. As if the storms were not enough of a challenge, the nearest power was ¼ mile away. 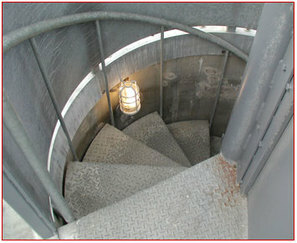 As a symbol of Santa Cruz Harbor's dedication to safety at sea, the Harbor Light House was constructed by a unique cast in place concrete process that required extremely tight coordination of trades to facilitate design constraints. A prefabricated spiral staircase was dropped in from above requiring exact alignment of interior light fixtures and electrical equipment. 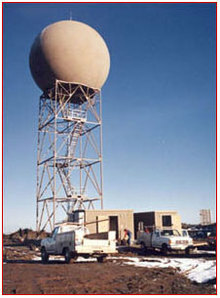 Nexrad Radar Station at the summit of mount Umunhum. Six week completion schedule on a remote site with limited access and storage space. The strictest of government specifications with esoteric material requirements made it a perfect project for the field as well as the purchasing department, we love a challenge! At 5000' elevation reached only by a one lane access road through a state forest, and in the winter, this project could not have presented more natural obstacles for timely completion. Add to that, the inability to store any materials on site due to the lack of level ground and you have a project ripe for disaster. On time, on budget, on top of the mountain! Carmel Valley Ranch, a luxury golf and spa resort. New Lighting, Power Distribution & Lighting Controls. 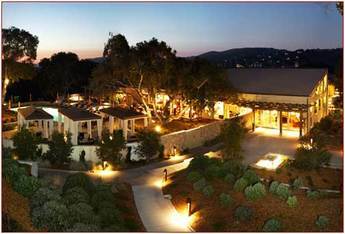 Complete power and lighting retrofit of a luxury golf and spa resort in Carmel Valley Ca. working around guest services, active golf course, and demanding schedule required finesse and the type of attention to detail Triad Electric, Inc. has become known for. 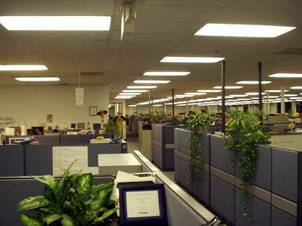 Even the humble “cube farm” can become a modern, energy efficient well lit workplace. 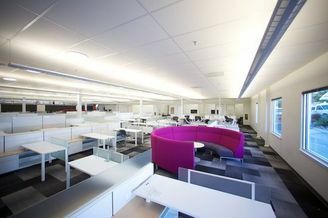 Lighting can enhance collaborative areas as well as formal conference rooms. Coupled with Triad’s expertise in video / audio presentation displays and sound systems and you have a state of the art conference environment. Opal Cliffs School, Design Assist. ICF Construction with ultra-energy efficient high performance lighting fixtures. Triad saved the school money by routing power through existing services instead of requiring new utility service. Our extensive school construction experience enabled the school district to occupy this space within 16 weeks of breaking ground. Value engineering on the part of Triad reduced the lead time and saved the school district in lighting and distribution costs as well as reducing the time to utility service by months.